Taormina is known as the pearl of the Ionian Sea, its beauty is uncontested. Some cities are known for their art/cultural treasures, others for their natural beauties… only a few, like Taormina, own both. Taormina is Sicily’s Number One tourist destination, boasting magnificent scenery, beautiful beaches and great local cuisine. The many tourist attractions such as the Greek-Roman Theatre, the shopping heaven along Corso Umberto, the typical open air cafés, secluded gardens and the views of Mount Etna create a magic atmosphere. As soon as you arrive in Taormina, you will feel the magical, mythical atmosphere spread all around which has enchanted visitors from all over the world for years and years. Settled on a hill of the Monte Tauro, Taormina dominates two grand, sweeping bays below and on the southern side, the top of Mount Etna, often capped with snow, offering the visitors a breath-taking, dramatic and memorable view over almost one hundred miles of Mediterranean Sea. Taormina has endlessly winding medieval streets and tiny passages, each with its own secret… wonderful restaurants, ice-cream bars, cafés and characteristic shops and boutiques. Taormina is beautiful by day, but in the evening its atmosphere is simply enchanting, whether you stroll the illuminated streets or indulge in the view of the coast over a delicious dinner. The most well-known and cultural event is the Taormina art festival. Every year from the end of July to September, concerts, theatre shows and film performances are scheduled. 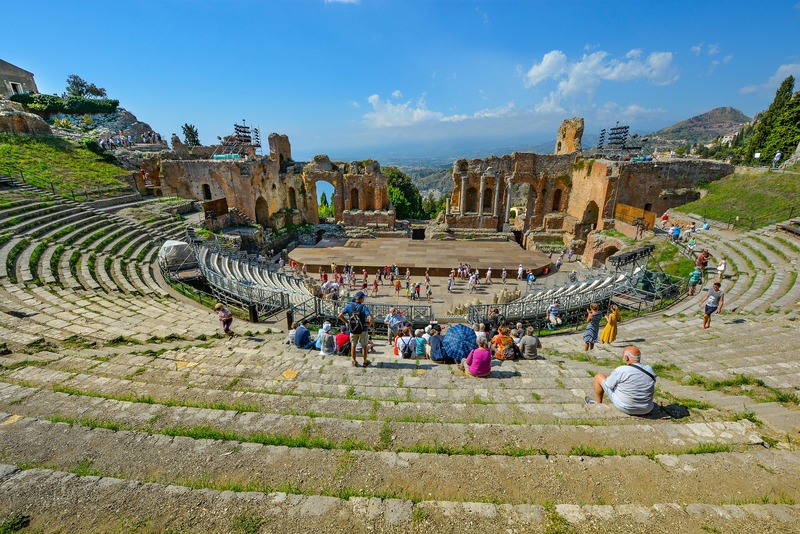 Taormina will leave you with a lasting impression of Sicily! Wild but unspoilt beauty, in spite of Mans presence, Isola Bella is protected by the WWF and was recently declared a Nature Reserve. It is connected to land by a thin strip of sand. It is a magical place that cannot be missed if you are near Taormina. The Isola Bella is the best place in the area to go snorkeling, with its amazing sea beds, fish and sea creatures.